We also provide great warranty for you such as one month free return back, 3 months for change, lifetime warranty. High Resolution Screen: The advanced technology brings you 1280*800 IPS to display photos & videos. So this digital calendar displays exact time in a large, bright and clear display that can be seen from across the room. High-Definition:The Color of our digital photo frame is applied delicately. It has a beautiful picture and vivid image in a high quality. Stay sweet and happy time more clearly. This is no doubt a new and great visual experience to you, bringing rich aesthetic pleasure. 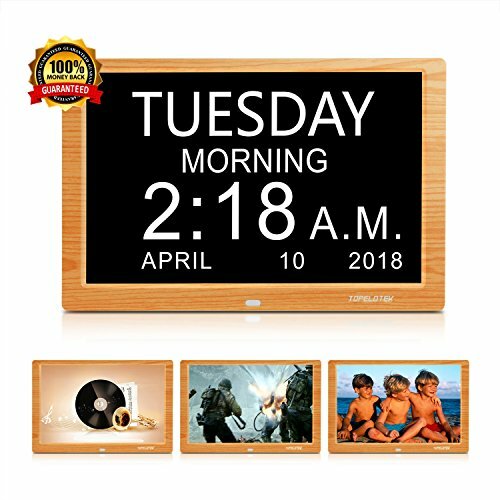 Easy to Use: This 10.1 inch digital calendar& frame is very easy to use, with no required setup and no software to install. Videos and photos will be displayed instantly as soon as you insert a memory card. It's very simple to operate. Remote-Control: All function infrared ray remote control. You can display photos, music, videos with remote control to be more convenient. If you have any questions about this product by TOPELOTEK, contact us by completing and submitting the form below. If you are looking for a specif part number, please include it with your message.